Situated on a hill, the villa attracts every cross current of cool air so there is no need for air conditioning, but each bedroom is equipped with an electric fan. The spacious master bedroom (17ft x 14ft) has a king-size bed, plus a sturdy folded single bed for a third person. There are two further double bedrooms (12ft x 12ft), one with a double bed, and the other with two single beds. There are two bathrooms, one en-suite to the master bedroom and one between the double bedrooms (showers only). There is also a wooden enclosed shower in the garden. The huge living-room (25ft x 25ft) has a breakfast bar, and is furnished with two four-seater settees, two matching armchairs and other comfortable seating, and there are pretty patterned straw mats on the stained wooden floor. There is satellite/cable television, stereo system with radio, a telephone, and internet connection. The living-room opens out onto a magnificent veranda (15ft x 44ft) with breathtaking views all around. The veranda has a solid round pine table which seats up to 12 guests, also a Mexican hammock, two teak loungers, and a rocking chair for further relaxation and comfort. The kitchen comes equipped with a large American refrigerator, microwave, oven, and all you'll need for self catering. (But if you want our splendid chef Julie to prepare your meals, all you do is ask her!). There is a spacious utility room with a washing machine, electric iron, and other useful amenities. Bedclothes are changed once a week, and towels when you want them. The villa is thoroughly cleaned before you arrive , but if you require further cleaning mid-stay or at any other time, our cleaner will charge you $EC150.00 for the job. There is no pool. All the neighbours have gardens where they grow fruit and vegetables, some keep a few chickens, a sheep, or a goat or two. Eco-tourism here is at its friendliest - you can choose the best of both worlds - sand and sea, and also a glimpse into the culture of St Lucia's most charming people. REDUCTION IN RENTAL RATES FOR A STAY OF 4 WEEKS OR MORE FOR GROUPS OF MEDICAL STUDENTS and INTERNS COMING TO STUDY AT NEARBY VICTORIA HOSPITAL. CONTACT MANAGER FOR COSTS AND OTHER INFORMATION. Cheers! That's me Dylyn, in the picture. I manage the villa which is co-owned by me and other members of my family. Some extended family members who live in St Lucia look after the villa and our guests. My husband (a retired lawyer) and I (retired PA) reside in London, United Kingdom. I love travel, adore entertaining, and strive to be content and happy for myself and for my loved ones. Because the town of Castries was where I was brought up and the villa overlooks this exciting city. Also, the villa is unique! It's the only holiday home I know of on the island, situated in a real St Lucian community where most of the residents happen to be old friends and tight-knit extended relatives. The beautiful Villa Frangipani stands amongst the homes of my lovely kinsfolk, always willing and happy to help each other and our guests. So here on holiday you not only have sun, sea and sand, but you get that extra buzz - a fascinating glimpse into the culture of St Lucia's wonderful people! 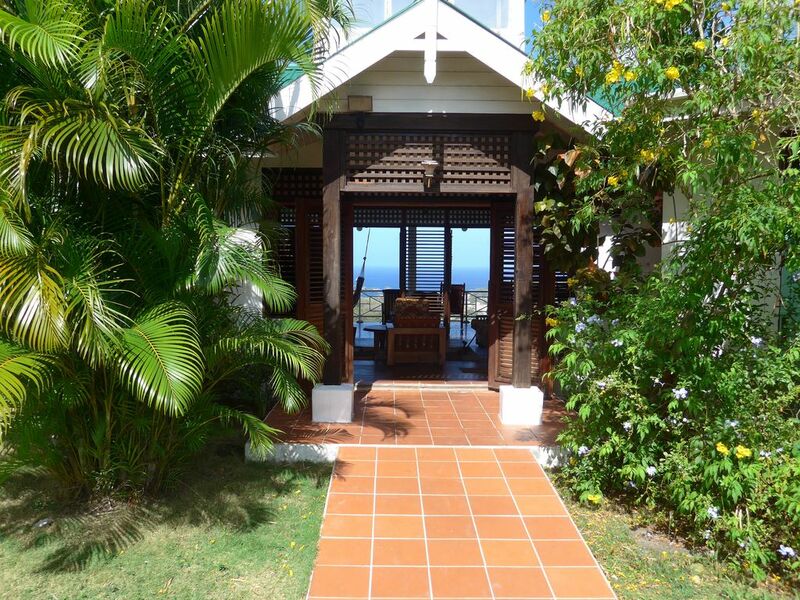 Staying at this gorgeous, wheel-chair friendly villa with probably the most stunning views on the island means that you can bring your family and friends to the best value-for-money holiday home in the entire Caribbean and you won't break the bank! And for wheel-chair users there is a ramp to the entrance, wide doors and corridors, grab-bars and easy to use showers. The villa is central to most places on the island from which you can easily travel to all other destinations either by public transport or by your own hired vehicle. Many guests say that our fantastic panoramic views could have them spending their entire vacation (armed with a cocktail or three) on our spacious veranda. And for me, my husband and family, we all adore our villa Frangipani and think it is the most beautiful place in the world. Bathroom 2 (en-suite) is equipped with 2 sturdy grab-bars. toilet, shower, Bathroom 2 has chunky shower chair and grab-bar near toilet. For guests who cannot stand: there is a sturdy shower chair which the Manager will provide. All you will need in a modern kitchen is provided except a dish-washer. Table and chairs for 8 persons in dining area on veranda. Some serious stuff, some holiday reading which guests have left behind, etc. veranda with possibly the best view on the island. There are NO stairs to climb in this villa, doors are wide enough and easy access through corridor and everywhere else. There are 2 traditional adjustable teak steamer chairs (sunbeds) with full length cushions, plus 2 beach chairs. Bedclothes are changed once a week and towels provided when required. Make arrangements direct with our manager/chef to cook for you if and when you require. It is strongly recommended that you have the villa cleaned by Angelique once every 7 days if you stay for more than 1 week. The per hour charge for cleaning is not at all costly and this must be borne by you, the guest. The cost for cleaning after you have left the premises will be borne by the owner. Rental prices are given for one week, but the villa may be booked for any length of stay. A stay of less than 7 nights will cost the same as a booking for one week. A stay of more than one week but less than two will be charged pro rata. It would be appreciated if bookings could start on the day or immediately after the previous booking has ended, so gaps less than 7 nights can be avoided. We had a great time at the Villa Frangipani and on the Island. We were really grateful to Dylyn the owner for her little “travel guide" which was contained in a Newsletter, and we tried a lot of the things she recommended. We travelled to the south of the island and went to the Ladera Resort and had a very enjoyable cocktail and an exceptional close-up view of the Pitons. We travelled to the north of the island and ate at Jambe de Bois restaurant, Pigeon Island. We visited Marigot Bay where we had lunch at “Doolittle’s” where the film 'Doctor Doolittle' was made. The “Jump Up” in Gros Islet was really entertaining, and we were happy at beautiful Anse Chastanet, Anse Cochon, and Ti Kaye Village. The last hours before departure were spent at the Rendezvous Resort, which was lovely and interesting, just as Dylyn’s Newsletter said it would be. In the evenings we spent several nights enjoying Hidden’s fantastic creole food, his rum punch and – of course – loads of Bounty rum and Piton beer J while experiencing some of the most wonderful sunsets. Every morning, after an early wake up call from the neighbourhood cockerel, we watched the cruise ships coming into Castries harbour. As I work in tourism, I liked checking out with my binoculars which company was arriving. We loved the rainforest and natural beauty of St.Lucia, and will hopefully come back in the future to stay at the villa Frangipani with the stunning views. We would like to thank Dylyn very much again for renting her lovely house to us. We will definitely recommend it to our friends. Thanks for this lovely review. I too am very grateful to you for choosing our favourite place for your holiday. We are thankful too for the pictures of the villa and garden which you sent us. And above all, thanks for saying that you will recommend the villa Frangipani to your friends. My husband and I had a wonderful 2 weeks at Frangipani. David uses a wheelchair and was able to access all parts of the house, he was even able to get his own beer out of the fridge ! The views were stunning and David loved getting up early and getting out on to the veranda to watch the cruise ships coming into Castries. It used to be us on the cruise ships coming into our beloved St Lucia so it was great to see it from a different angle. We have been coming to St Lucia for many years but this is the first time self catering. Hidden and Julie were lovely and Julie's caribbean cooking was yummy as was Hidden's rum punches, wow!. It was great sharing caribbean life with friends and family of the owners, a real home from home. David had a little trouble in the shower as he is unable to stand but Hidden provided us with a plastic garden chair which solved the problem straight away. Nothing was too much trouble, they looked after us so well. Mosquito nets were very helpful and well worth using. We did get a few bites but nothing troublesome, just need to take plenty of mosquito repellent and cream for bites. Dylyn and Chris's Newsletter was the best i have ever read - it covered everything you would need to know - the good and the not so good. I found it so useful, even down to telephone numbers for the airport, taxi's if needed, emergency services and pleasure/ideas for activities and excursions. We spent a day at Rendezvous Hotel where we have stayed many times in the past but we looked forward to going "back home' to our lovely view. As David is disabled we hired a car for the whole holiday which was great. A friend of the owners has a car hire company and they met us at the airport driving us to Frangipani and did the same on the return journey - this was so helpful for us and a great way to start and end the holiday. We will be back next year hopefully with my mum and brother and his wife who I think will love it. Thank you for letting us share your lovely home. Thank you Vicki for putting a smile on my face! Not just a sea view - our spectacular, panoramic views will knock your socks off! We overlook the city and surrounding hills, harbour mouth, beach, small airport, the Vigie peninsula, several bays and inlets forged by the Caribbean sea, and there's the island of Martinique whilst doing the washing up! Situated in the heart of a semi-rural neighbourhood, members of the community are mostly related and have a sense of responsibility to each other. This caring hospitality is extended to Frangipani guests but there is no intrusion on privacy. Far from the madding crowd but within easy reach of restaurants, clubs and shopping, the villa is just 1 mile to the centre of town, also 1 mile to the local beach - a 20-30 minute walk if you're reasonably fit, or a very short transport journey through the most picturesque landscapes of eastern Castries. Not absolutely necessary to hire a car, little 12-seater public transport buses are loads of fun and the bus stop is just yards from the villa. Golf: St. Lucia Golf & Country Club is about 5 miles from the villa Frangipani. It is open all the year round and features the only 18-hole golf course on the island. Located on Cap Estate, this course is set in green rolling hills with a stunning panoramic view of the Atlantic Ocean and the sapphire waters of the Caribbean sea.